The mount consisted of a 2×4 run between two structural metal studs that ran at about a 45 degree angle up to the ceiling. I used existing holes in the studs to set the 2×4 in. Small blocks were bolted to the ends to make sure it stayed in place. The 2×4 did need a little trimming on both faces to fit into the existing stud holes. For the sake of over-engineering, I ran a second 2×4 across the top of the main support for added stiffness. 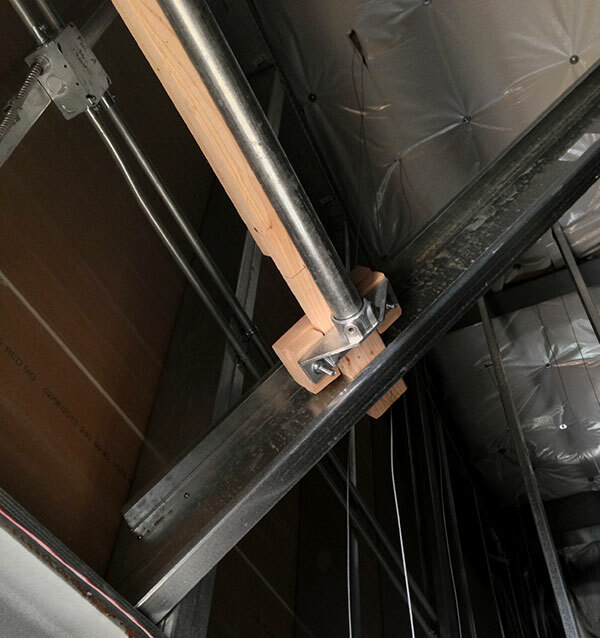 For the Kee Klamp side of things 1-1/2″ stair tread supports were used to attach the horizontal pipe to the 2×4. A T fitting was used to attach the vertical pipe to the horizontal pipe. The vertical pipe was painted black and an end cap was added to the exposed end. One thing that’s not shown in the pics is the two holes that were cut in the top and bottom of the pipe to run the HDMI and TV power cables through. The TV that was used only weighed 10 pounds so the mount has no trouble holding it. I’m confident, after hanging from it, that it could support much more.